Really any squash will work for this, but I like to try different squashes each week just to change it up! Preheat oven to 300°F. 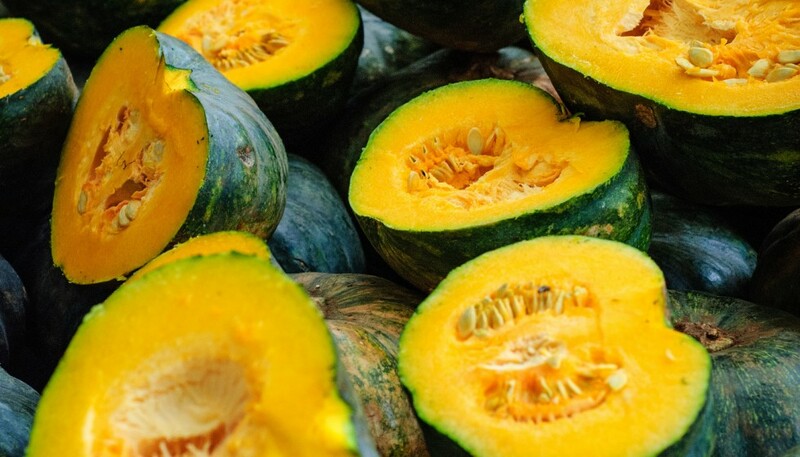 Remove the pulp from the seed and sprinkle with a bit of salt and curry powder (optional) and spread out evenly on a sheet pan and roast in the oven alongside the squash. Check after 20 minutes as they will need to be scraped with a spatula and turned. Cook until just crispy, not browned. Season kabocha halves generously with salt and a perhaps sprinkle of curry powder drizzle each with olive oil, and place flesh side down and bake until tender, about 55 minutes. Heat the coconut oil in a heavy 8 qt sauce pan over medium heat. Add sliced onion and cook for about 20 minutes, stirring occasionally, until onions are soft. Add the garlic, ginger and ground spices, turn the heat back up to medium high, and sauté for 1 minute. When the spices are fragrant , add stock, and another big pinch of salt. Partially cover the soup and let it simmer gently until the squash is ready. Once the squash is cooked, allow to cool, then scrape out the flesh and add it to saucepan. Mash the squash pulp in with the liquid. Bring the soup up to to a simmer and slowly cook for 10 minutes. Adjust the seasoning as you wish. Sprinkle the seeds on top for garnish.